On 26 April 2018, at the West Midlands chairmen’s lunch at the delightful home of Roly Trevor-Jones, Angela Watkins, the church recorders’ group organiser for The Arts Society Royal Leamington Spa, was presented with a Golden Jubilee award. This is “in recognition and appreciation of her outstanding contribution to volunteering for The Arts Society”. Angela has been group organiser almost since the inception of the church recording group in 1996. The group has recorded seven churches and is currently working at St Francis of Assisi, the Roman Catholic church in Baddesley Clinton. She has recently retired as the West Midlands Church Recorders’ Area Representative, having been in post for twelve years. 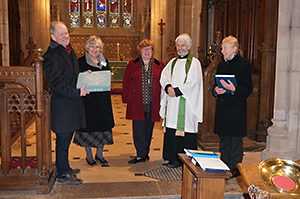 On Sunday 12th February 2017, the completed Church Record of St Leonard, Charlecote was presented to Revd David Jessett at a more than usually full church. Kerrith Carr, one of the recorders, had embroidered a NADFAS kneeler (the former name of The Arts Society) which was also presented. The seventeen members of The Arts Society Royal Leamington Spa group of church recorders started work in Autumn 2015 and enjoyed working in this lovely building. Probably the outstanding features were the Fairfax Lucy memorials in the Lucy chapel. The other item of interest was a 1633 Bible which was hidden away in a drawer. This was subsequently lightly conserved and put into a custom made dropback box. This work was funded by The Arts Society Royal Leamington Spa. At the presentation Chris Pickford, the reviser of Pevsner’s Warwickshire, was in the congregation. He had been a useful source of information allowing the recorders to access his working notes. The recorders were made most welcome at the service and refreshments were served afterwards whilst everyone had a chance to look at the Record. The St Mary Magdalene record was presented to the church on 19 July at their patronal festival service. The record was dedicated to two late recorders – Veronica Clarke and Dorothy Hicks, both stalwarts of the group. A kneeler was also presented. This had been worked by one of the recorders. It was a lovely occasion with many recorders and members of the committee present. Church – Leek Wootton (2010–2012). 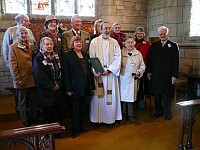 At a well attended service, Angela Watkins presented the bound Church Record of All Saints, Leek Wootton to Revd Jim Perryman. Elizabeth Hunter, past Chairman of the Society who was Chairman when the recording began, was present along with several of the recorders. The Record was well received and the PCC had kindly agreed to pay for the binding.